It’s hard to believe, but we are now in our fourth year of touring Shakespeare’s plays to the most disadvantaged primary schools in Surrey with Delight Charity. 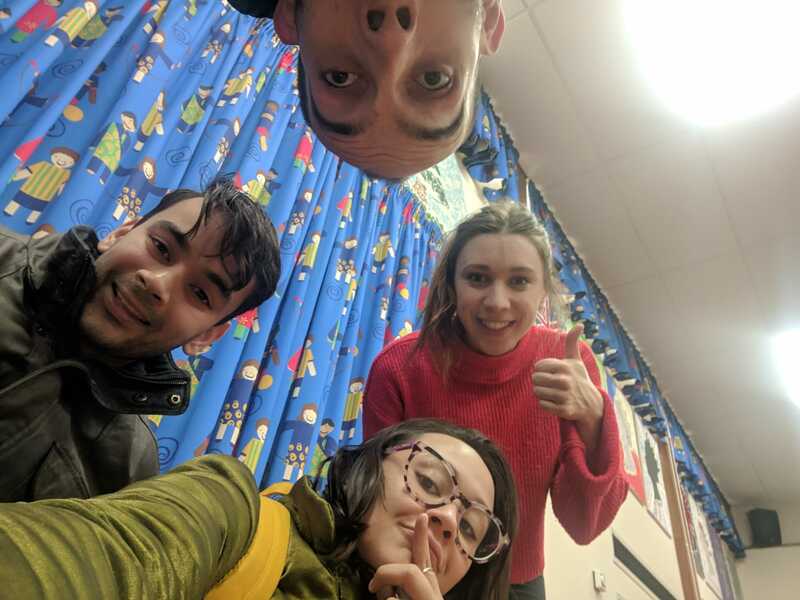 This year, fourteen schools host our four actors (and our Little Will puppet), who bring our unique and energetic take on Shakespeare’s A Midsummer Night’s Dream into their school hall. As they enter the end of the first week, Ant Stones caught up with the actors to see how the tour was going. Ant: What’s it been like getting Dream on the road? Dewi: It’s been lots of fun, and really makes you feel like travelling player from Shakespeare’s day! It’s been amazing see to the kids’ responses to the show and how engaged they are! Sam: It is nerve-wracking at first. There is a lot to think about. Early morning traffic, preparing all the set, props and costumes and warming up. It is a lot to get done in a short space of time. But the schools have been brilliant and the children who have got involved with the play have been amazing. They have just thrown themselves into it. I won’t lie. I miss my lie ins, but this tour feels like it is going to be a good one. Hannah: It’s been great to get the show up and running in front of our audiences. The children have been so keen to take part! Pucks, Kings and Queens have been jumping in left, right and centre to fill in the roles we can’t quite cover between the four of us. This is a relief because we have about 10 costume changes each! I’m excited to see how the show continues to grow and develop for the rest of tour. Ant: That’s great. What’s been your favourite moment of the tour so far? Sam: Am I allowed to say that my favourite moment was when Hermia was told that as punishment for not obeying her father she’d have to live with a Nun? Ant: Yes. I can explain that. In our second performance a young girl volunteered to play Hippolyta. When she was meant to say, “you will die or live as a nun”, she came up with a far worse fate. She’s a powerful ruler and not be messed with, so that was that. Hannah: I have to say I have loved performing the fight scene, because the children just get so excited. You feed off their laughter and energy and it makes for so much play. We find new moments in it every time. Dewi: I think yesterday afternoon, it was Chandlers Field’s first Dream performance and they didn’t know what to expect. The staff were nervous and the children came in quietly and shy, but when the show came up, they were all so engaged and had a lot of fun! Our second puck, in particular, really shone here. She spoke confidently in verse. I was really touching and rewarding to see every kid laughing and enjoying themselves. They didn’t want it to end! If you’d like to learn more about Delight Charity, the tour and our outreach work, please visit the Outreach pages of our website.